I like birdwatching and taking pictures of birds. I could never get close enough to take a good picture until now. With gphoto2 I can set my camera on a tri-pod in my backyard right in front of my bird feeders. I connect the camera via USB to a netbook. The netbook sits under the camera on the tri-pod. The netbook is connected to my wireless router via Wi-Fi. 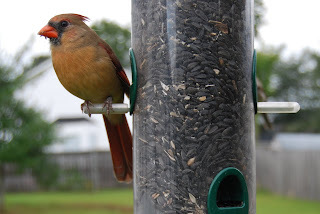 I have a computer in the living room that has a window view of my feeders. I remotely connect to my netbook using the ssh command. When a bird comes in to feed I execute the gphoto2 command on the netbook and now I've got an up-close-and-personal photo of the bird. The command scp above performs a secure copy from the netbook to the computer in the living room. I didn't get to spend much time taking pictures due to the inclement weather but I did iron out my work flow. 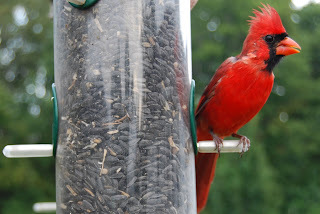 Below are a couple shots of up-close-and-personal cardinals. Click on the photos to enlarge.